It’s said that dice were invented over 4,000 years ago! Dice were around long before playing cards. The ancient Egyptians played with dice in their famous game called Senet. 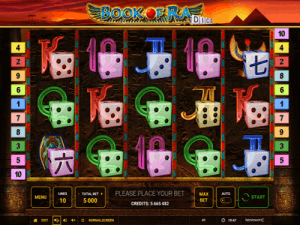 Novomatic’s Book of Ra has been given a makeover for this slot game. Every symbol in this game is represented by the face of a die! There’s a number die and there’s a die that’s covered in symbols. These symbols on this die are ancient Egyptian, so they fit in nicely with the game. Book of Ra Dice has 5 reels and 10 paylines. The RTP for this slot is 95.10%. Like the original, the bonus can be triggered any time. It gives Free Spins with a Special Expanding Symbol! This is just one of the slots in one of Novomatic’s most famous bundles! The first slot from this series, Book of Ra (classic), was released 15 years ago! Due to its popularity amongst players worldwide, Novomatic have continued to release more slots that are based upon the same theme. All of them have almost identical symbols and bonus game but then they each have their own unique twist. Book of Ra 6 Deluxe, for example, has 6 reels instead of 5. Book of Ra Jackpot Edition has a jackpot, and Book of Ra Magic which can give you multiple expanding symbols during the free games! There are 10 symbols in total in this Novomatic casino slot game. Each one is represented by a die and either has casino reference or a reference to ancient Egypt. All symbols give payouts for the right number of matches. Low value symbols give payouts for 3 matches or more. High value symbols, on the other hand, give payouts for 2 matches or more. The low value symbols are the casino themed symbols! These take their inspiration from playing cards. The 10 symbol is represented by the ‘two’ on the number die. The Jack is represented by the ‘three’. The Queen is represented by the ‘four’, the Ace by the ‘five’ and the King by the ‘six’. Then, there are the picture symbols, which are the high value symbols. There’s the ancient Egyptian scarab beetle, represented by the purple die. The Isis statue symbol is represented by the blue die. There’s a death mask (from a pharaoh’s mummy) which is represented by the green die. The Book of Ra famous explorer and archaeologist is represented by the red die. Finally, the Book of Ra itself, is represented by the yellow die. The Book of Ra symbol is a high value symbol but, unlike the other valuable symbols, it only awards payouts for 3, 4 and 5 matches (like the card symbols). The bonus in Book of Ra Dice is just like the bonus in the original game. To trigger the bonus round, you must spin the reels and land three Scatter symbols in one go. The Scatter symbol is the Book of Ra symbol. This golden book owned by a great pharaoh can also act as a substitute for any of the dice symbols! For these Scatter wins, you get a payout and 10 Free Games! The Free Games form the bonus round and they come with a Special Expanding Symbol. This is an oldie but a goodie. It’s just like in the original game – the book will flip its pages, showing the different symbols, eventually landing on the symbol of choice. The symbol the Book of Ra shows will be the Special Expanding Symbol throughout the 10 Free Games. This symbol will have the ability to expand over entire reels and award wins, even if they’re not consecutive! Throughout the normal game, the slot only awards the payouts when matching symbols land consecutively on paylines. Throughout the Free Games, the Special Expanding Symbol can get wins in any combination (regardless of paylines or consecutive reels) as along as the minimum number of matches has been satisfied. That means the Special Expanding Symbols essentially pay like Scatter symbols.